Hello! This post is about Boot's meal deal, where you get a sandwich, a snack and a drink for £3.39. 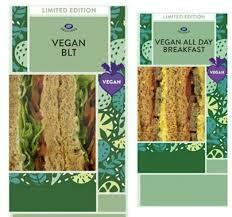 There are vegan sandwiches in the meal deal! And I think sushi and a salad (products are always limited edition and so vary). Making your own is a cheaper option, but sometimes life just doesn't allow this! Current sandwiches as of 30/12/2018: Vegan BLT and vegan all day breakfast! Today I got the new sandwich, plus a quite expensive graze snack box and a drink, meaning I saved £2.05 compared to buying each item separately. There is quite a lot of choice in terms of drinks and snacks as it includes everything from flavoured water to full bottles of brands such as coca-cola or fanta (I know this brand is not for everyone, just as an example), as well as quite a few crisps and interesting nibbles such as these graze boxes (I got a dark chocolate cherry tart one with pecans, dried fruit and dark chocolate buttons in, very nice!). This is the first meal deal I've bought that actually felt worth it, plus the new sandwich is really good! So if you need a reasonable meal deal, this is a good one to pick!